Four people had to be rescued from a tunnel in Chula Vista after apparently being overcome by smoke. 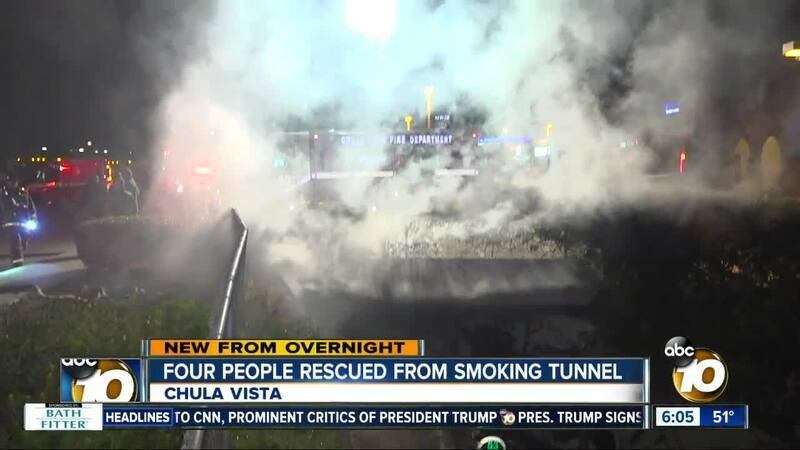 CHULA VISTA, Calif. (KGTV) – Four people had to be rescued from a tunnel in Chula Vista late Thursday night after apparently being overcome by smoke. At around 11:15 p.m., police and firefighters responded to a report of a fire coming from a tunnel at 745 H Street, near Woodlawn Avenue. Responding firefighters used ladders to access the tunnel and helped lead four people out of it. One person was taken to the hospital to be treated for smoke inhalation, but the others did not appear to be hurt. Police said they believe the four people were homeless and may have started a fire in the tunnel to keep warm or cook.